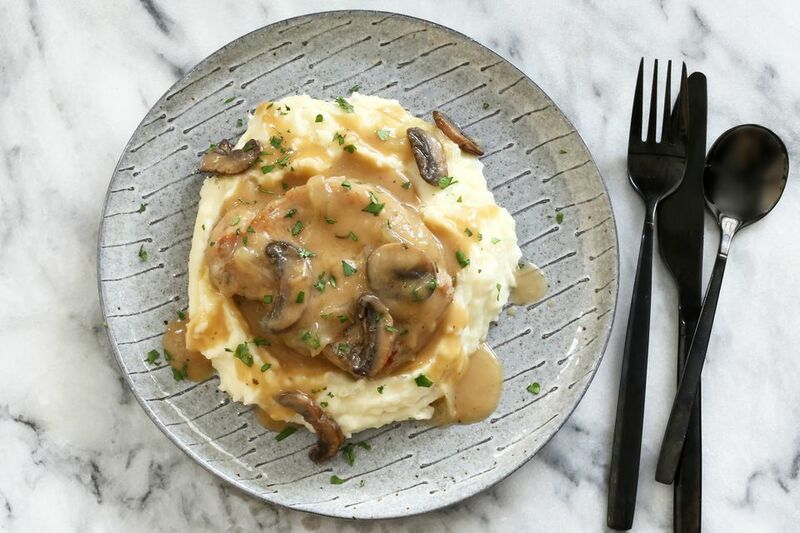 These Instant Pot pork chops feature fresh ingredients and a rich gravy, making it a dish you can feel good about in more ways than one. "Smother" the finished chops with the creamy sauce and vegetables, the perfect accompaniment to a mound of mashed potatoes or hot cooked noodles or rice. Boneless pork chops are an excellent choice for this entrée, but bone-in chops may be substituted. Choose the Instant Pot sauté (normal) setting, and add the butter and oil. Season the pork chops with salt and pepper, and add them to the hot fat. Cook for about to 4 minutes on each side, or until browned. Transfer the chops to a plate and set aside. Add the sliced onion and mushrooms to the pot and continue to cook for about 2 minutes, or until the onions are just beginning to soften. Cancel the sauté function. Return the pork chops to the pot and sprinkle with the chopped rosemary or thyme. Add the chicken stock along with a few sprigs of rosemary or thyme. Place the lid on the Instant pot and turn the steam release vent to the sealing position. Choose the manual or "pressure cook" button, and set the timer to 9 minutes. When the time is up, let the pressure release naturally for 15 minutes, then carefully turn the steam release vent to venting to release the remaining pressure. Remove the pork chops and vegetables to a bowl or plate with a slotted spoon, and set aside. If desired, skim off excess fat or pour the liquid through a gravy separator, then return it to the Instant Pot. Choose the normal sauté button and continue to simmer the liquids while preparing the cornstarch and cream slurry. In a small bowl, whisk the heavy cream with the cornstarch until a smooth paste has formed. Whisk the cream mixture into the simmering liquids and continue to cook until thickened. Taste the sauce and season with salt and pepper, as needed. Add Worcestershire sauce to taste, if desired. Arrange the pork chops on a platter; top them with the onions and mushrooms and spoon the sauce over all. Serve the chops on mounds of hot mashed potatoes or with noodles, and garnish with chopped fresh parsley. Make it a meal: After step #4, place a steamer basket on the chops. Peel about 1 1/2 pounds of potatoes, and cut them into chunks. Add them to the basket and cook as directed.